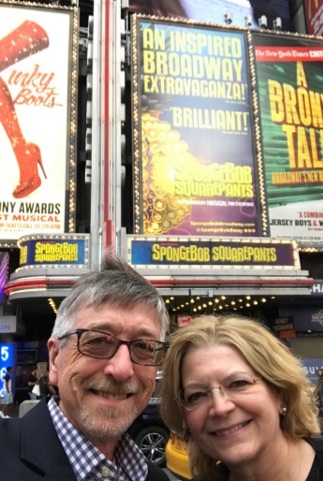 ALBUQUERQUE, NM – NTCA Trainer/Presenter Robb Roderick drove through Albuquerque, NM today on his way to the association’s first 2018 western swing workshop, located at Bedrosian’s in Anaheim, Calif., set for Wednesday night, January 17. 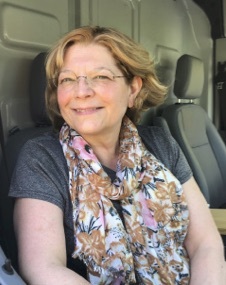 He was able to connect with TileLetter editor Lesley Goddin, based here, for a quick lunch at Albuquerque’s famed Owl Café, before continuing his journey across New Mexico, Arizona and into California for the workshop. 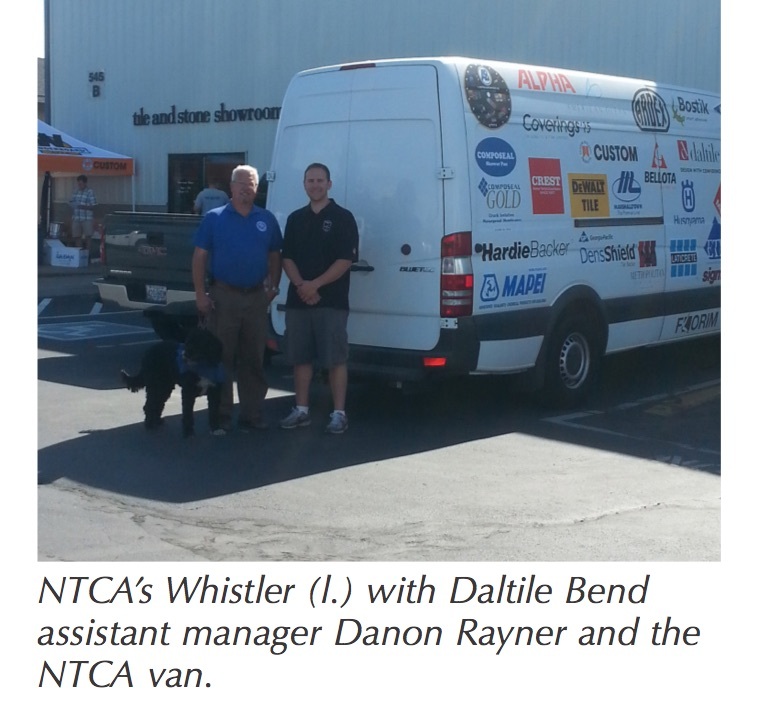 NTCA Trainer/Presenter Robb Roderick with TileLetter editor Lesley Goddin in Albuquerque, NM. Roderick drove through Albuquerque from his Missouri home on his way to present the first NTCA Workshop of 2018 at Bedrosians in Anaheim, Calif., on Wednesday, January 17. 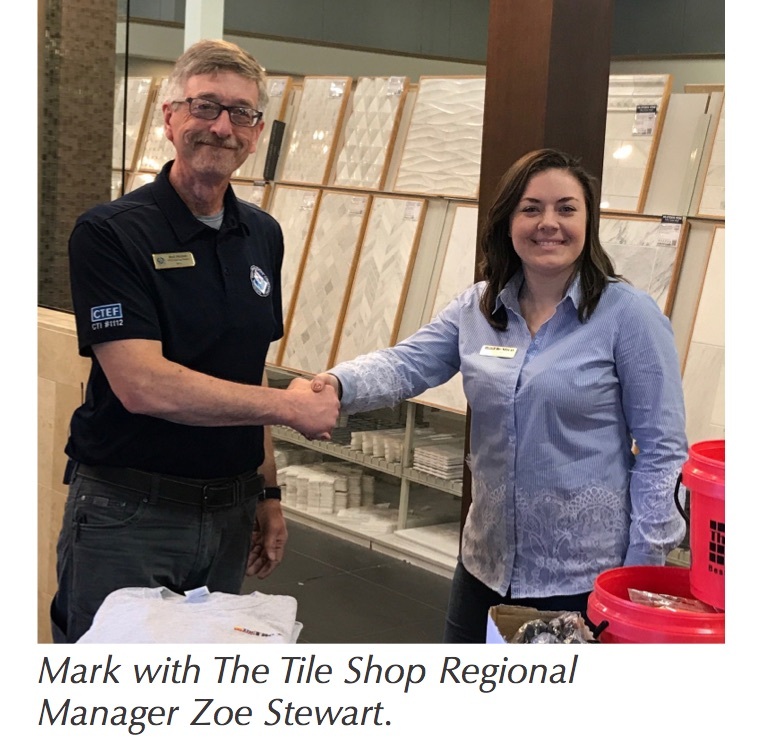 The NTCA Workshop program has a new theme for 2018: Tile Matters: Best Practices for Pros. 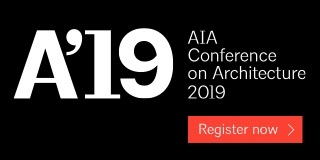 The three-hour program – most often held from 5 pm – 8 pm – includes an hour of networking and catered meal followed by two hours of all new educational presentations and interactive opportunities. 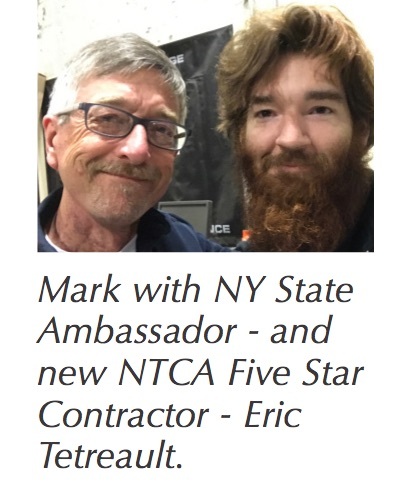 This year, not only will participants to the free workshops benefit from the presentations and product/method demos by NTCA Trainer/Presenters, but there will be more opportunities for attendees to have real hands-on experience with the products and methods being discussed. 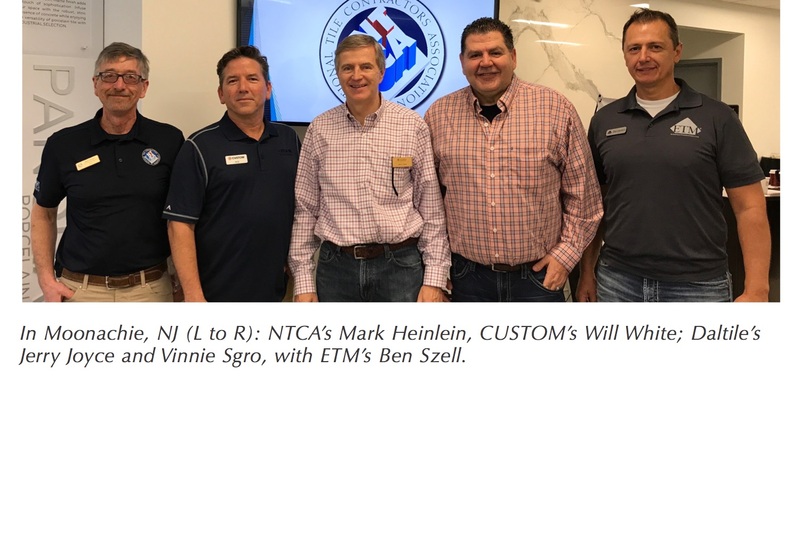 In addition to Robb Roderick, workshops are being presented by NTCA Training Director/Trainer/Presenter Mark Heinlein and NTCA Trainer/Director Luis Bautista. 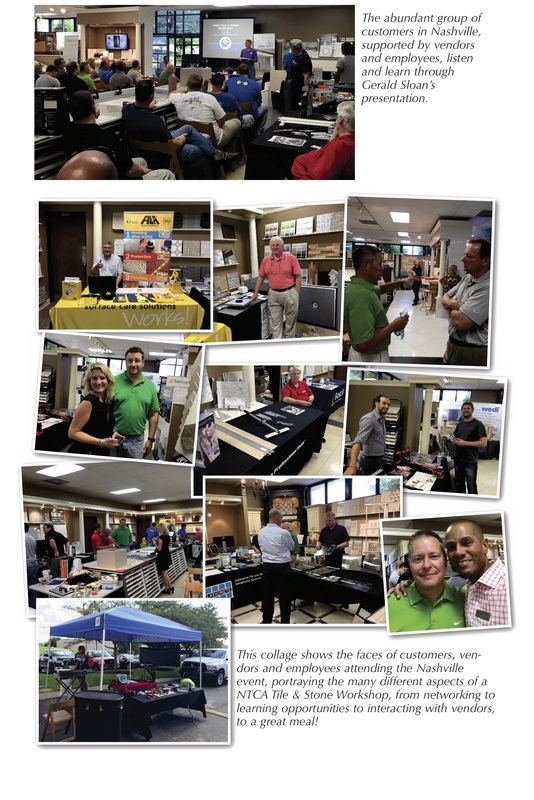 CTEF’s Scott Carothers is presenting CTEF Educational Workshops as well, and kicked the year off with one at Floor & Decor in Buford, Ga., on January 4th. 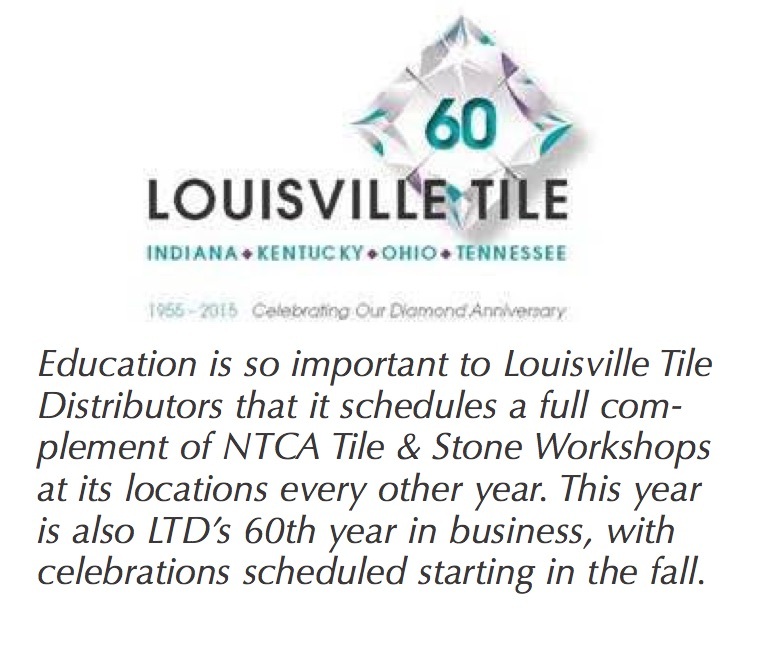 The National Tile Contractors Association (NTCA) will celebrate 70 successful years as a leading trade association in 2017. 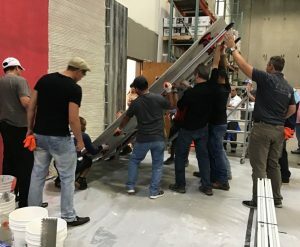 Each year, the NTCA reaches over 4,000 industry professionals through a variety of educational programs including hands-on workshops, through which it provides training for installers and tile industry professionals on industry standards and how to prevent and address problems on the job. 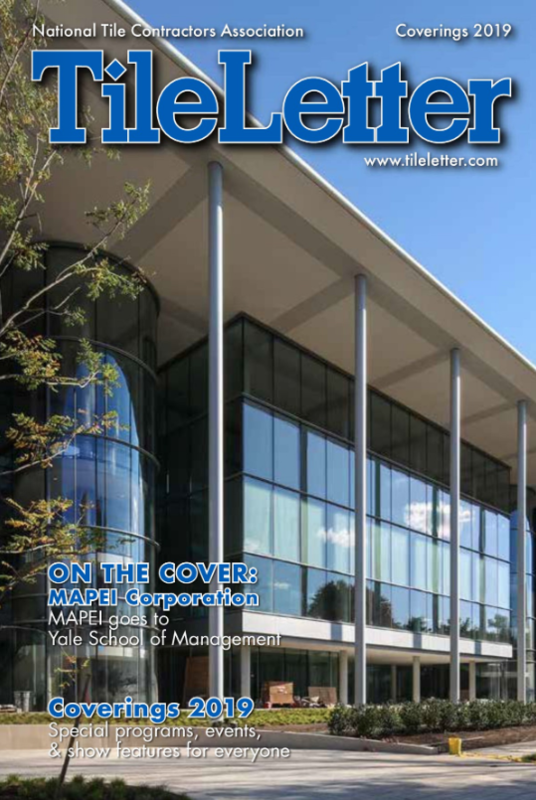 These educational programs are fundamental to the continued success of the association. 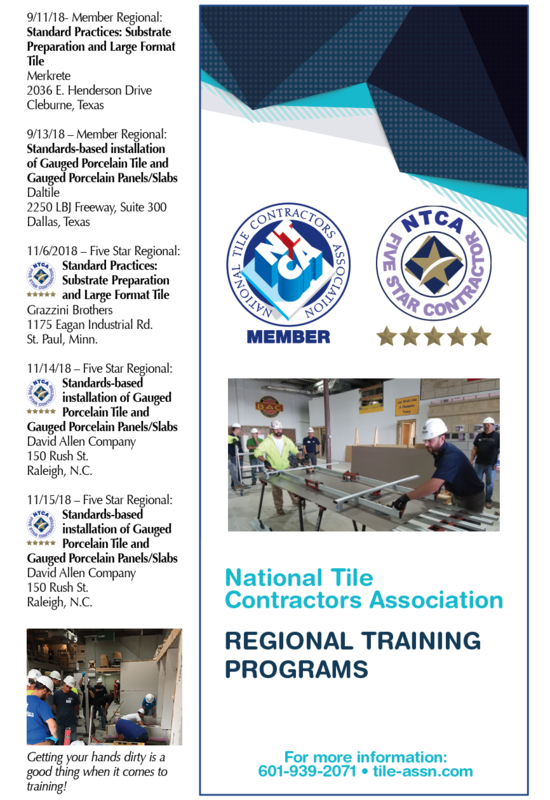 Utilizing four trainers, over 140 educational workshops and training sessions are scheduled for 2017, the most training seminars in NTCA history. 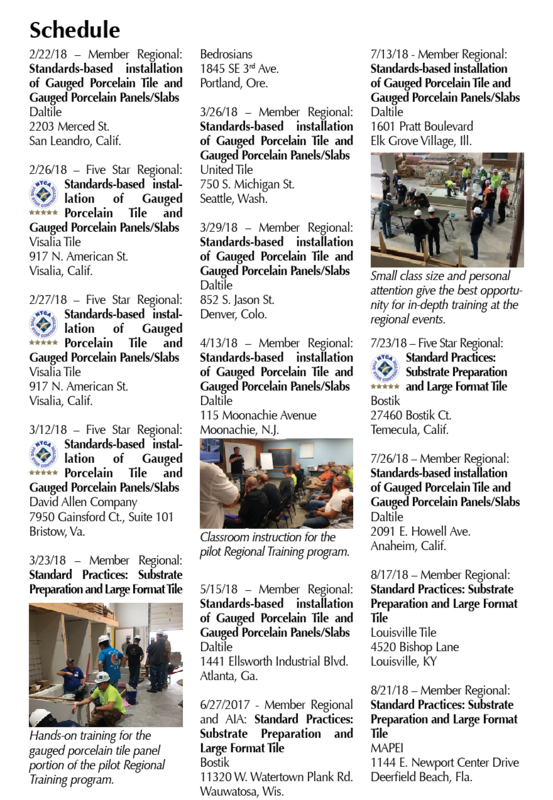 In addition to record-breaking workshop numbers, for the first time ever, the association will perform training programs in Spanish, to be held in ten locations across the country, where the language is spoken commonly in the construction industry. 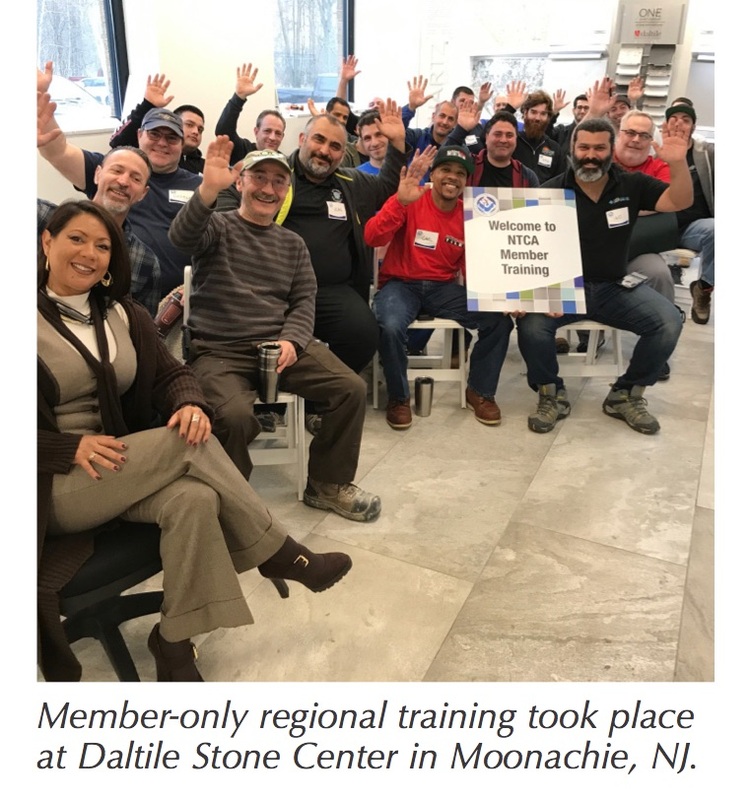 A major sponsor of the workshop program in 2017 is Daltile, who will host over 120 programs alone. 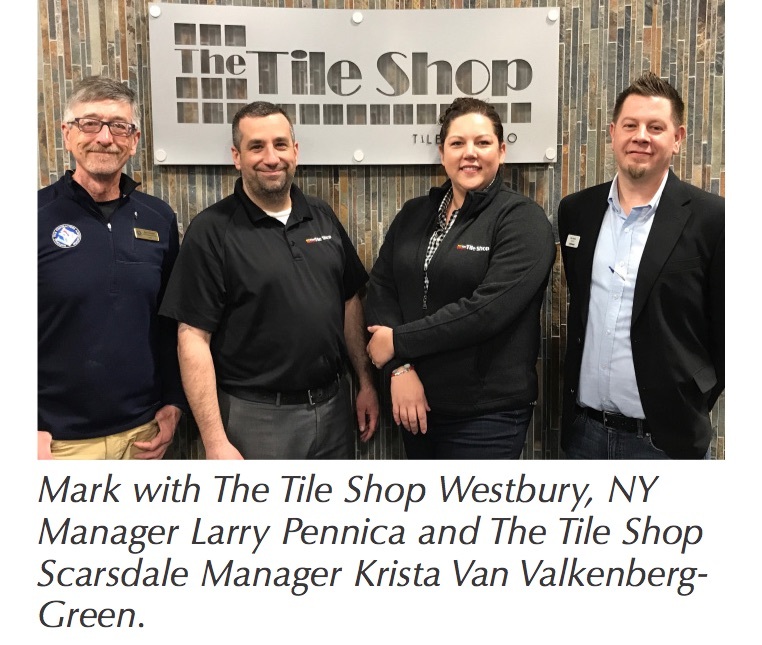 Additional sessions will be supported by independent distributors including The Tile Shop and Louisville Tile, who are set to host 14 and eight educational events, respectively. 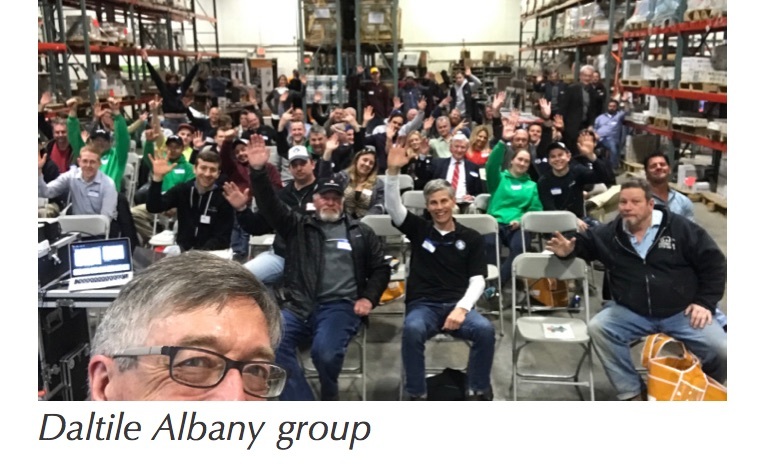 “The success of the educational workshops in the first quarter has been so strong, that several independent distributors are working with NTCA to add more events in more locations this year, making it possible that the number of seminars will increase to more than 150 by the end of 2017,” said Bart Bettiga, NTCA executive director. In addition to workshops and educational seminars, trainers also perform custom-sponsored programs and will complete several this year. To learn more about hosting an NTCA workshop, please contact NTCA assistant executive director Jim Olson at [email protected], via telephone at (612) 788-4726, or visit www.tile-assn.com. 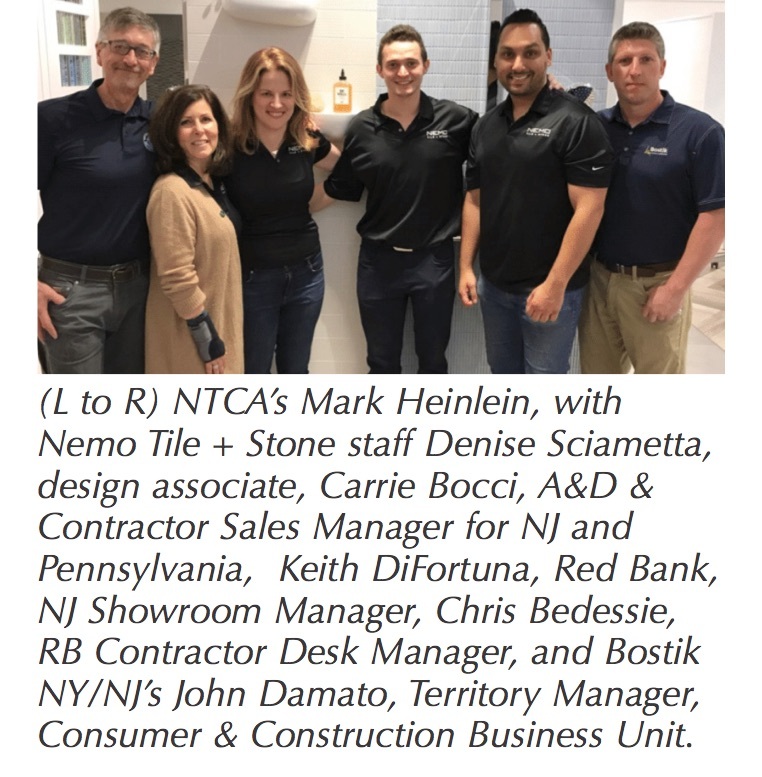 Last week, NTCA Technical Trainer Mark Heinlein visited with Five Star Contractor Dalene Flooring in South Windsor, Connecticut. 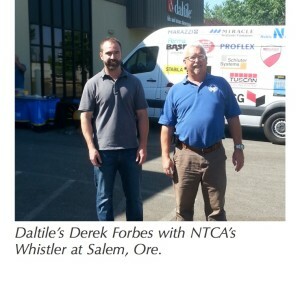 Chris Dalene (right) and one of his hardwood flooring experts discussing the tuning of the floor and removing “dead spots” where the basketball has slightly less bounce due to the use and changing conditions of the floor. 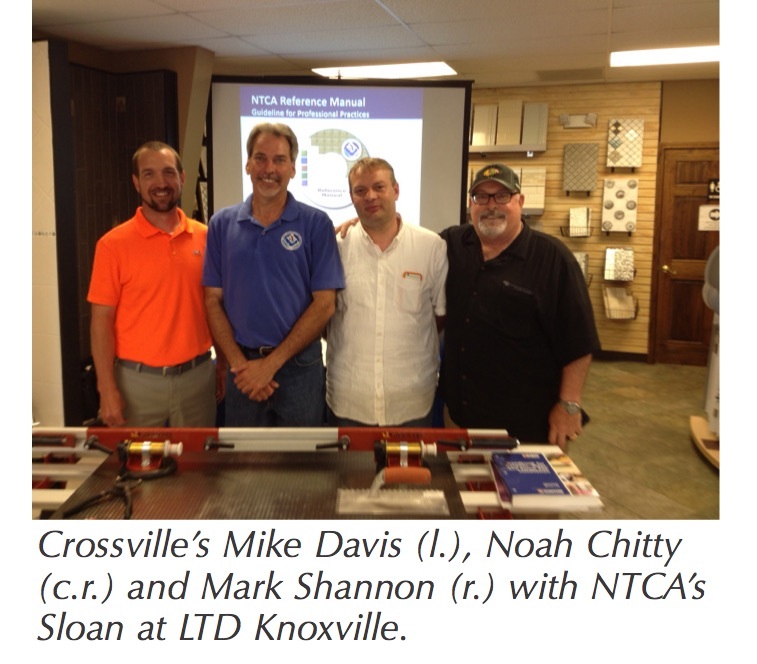 New NTCA trainer Mark Heinlein presented the first NTCA Tile & Stone Workshop of the 2016 campaign at Daltile in Jackson, Miss., on February 23rd, with very positive results and feedback. 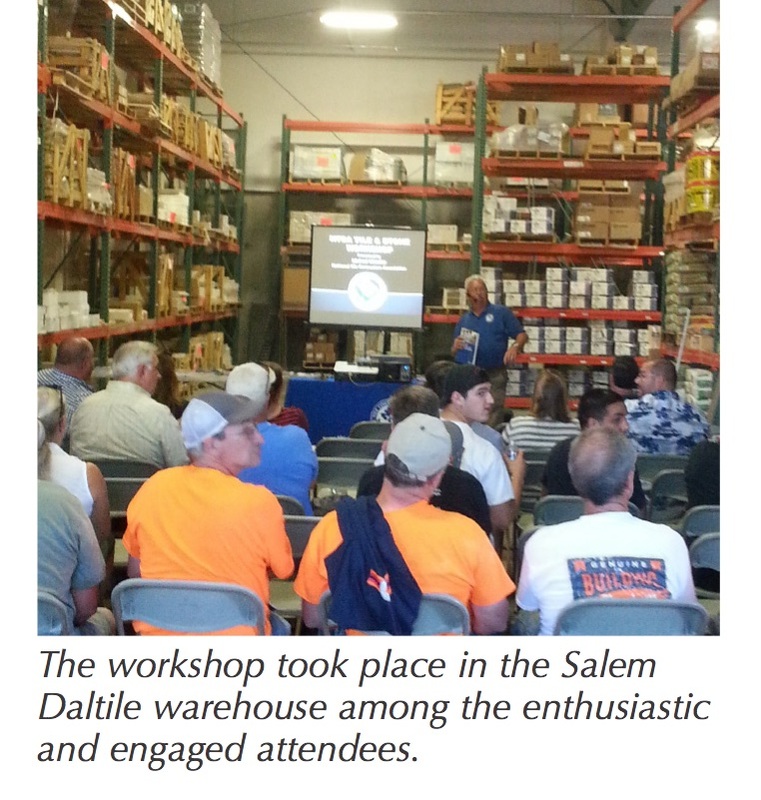 Almost 30 Daltile customers enjoyed lunch and a presentation by Heinlein on jobsite failures – and one new member signed up at the workshop. 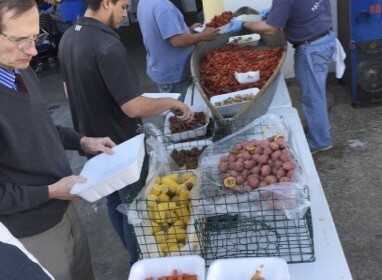 The New Orleans crowd enjoyed a crawfish feast by Tasty Tails. 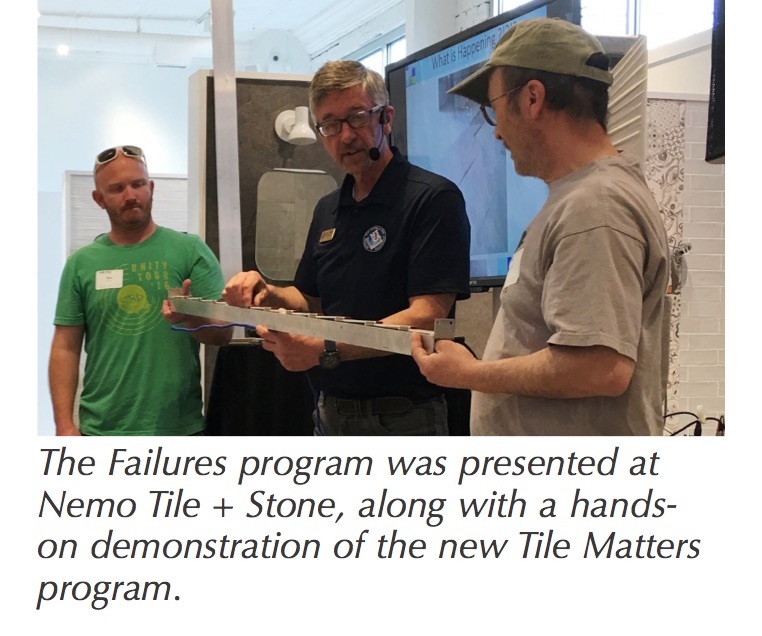 This new program focuses on what causes installation problems and challenges the audience to do the job right the first time. 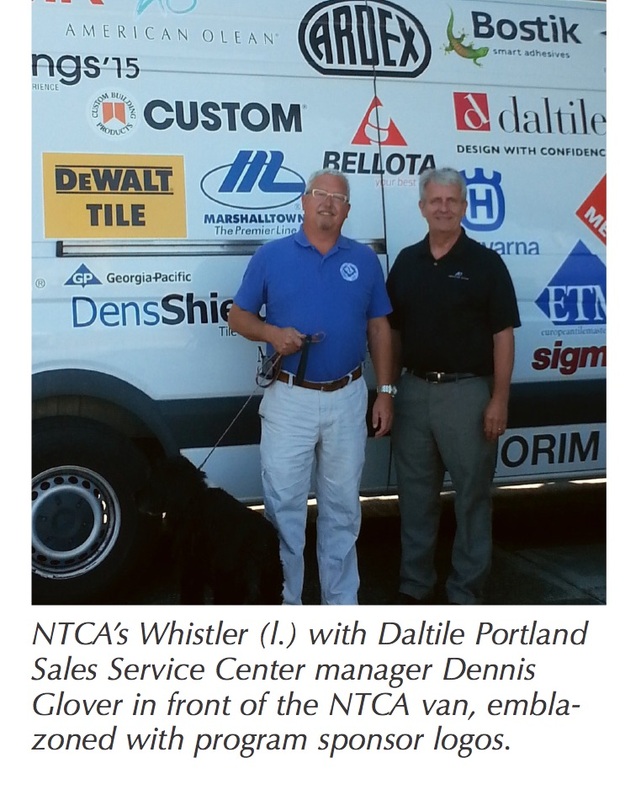 Daltile is hosting 100 NTCA events in 2016. Next stop was Baton Rouge, where 22 attendees showed up in addition to Daltile staff. 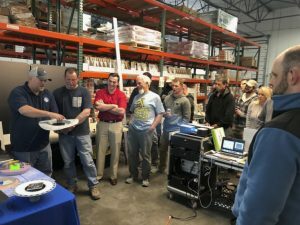 Heinlein then took the show to Emser in New Orleans where a crowd of about 45 were present, plus Duhe and Baker who helped support the event by speaking about qualified labor, specifications, business practices, and technical questions while networking with the crowd. 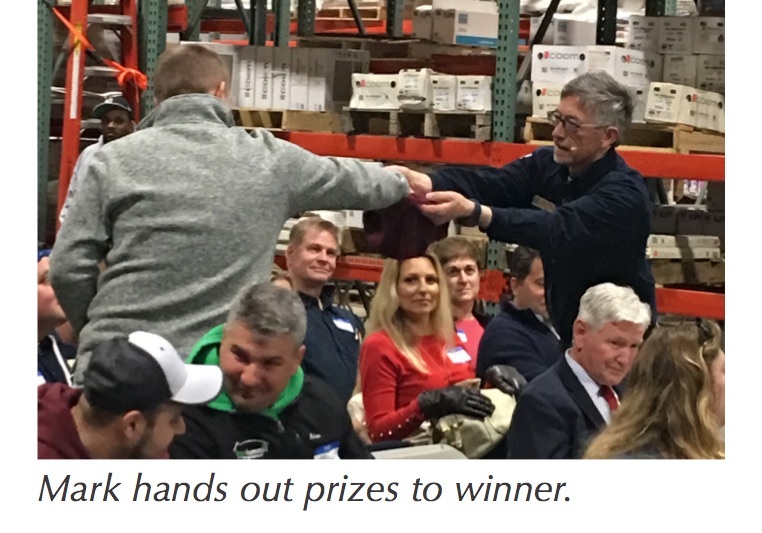 An animated Q&A discussion took place during the PowerPoint presentation with questions coming from architects, designers, contractors, installers and sales – in fact 11 people submitted paperwork for CEU credits. On the west coast, NTCA trainer Michael Whistler is getting ready to go on the road with several upcoming programs. 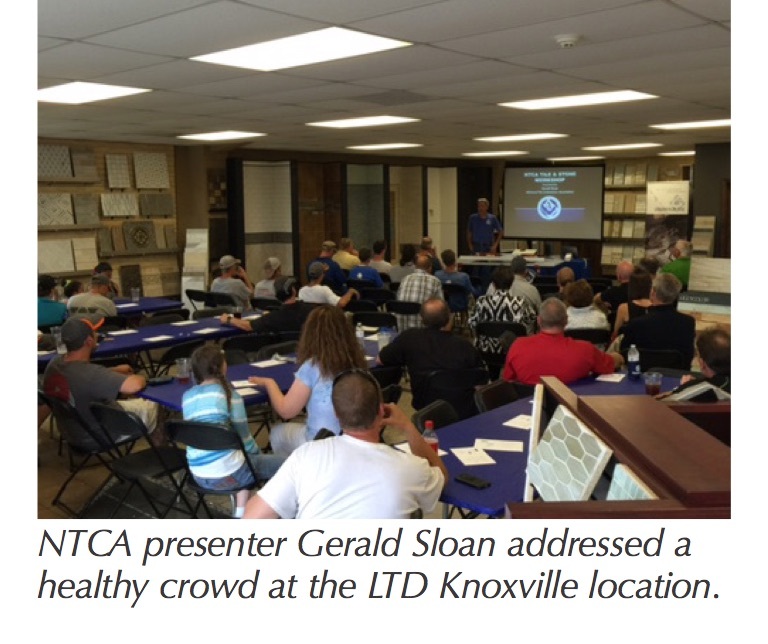 Go to the www.tile-assn.com for a complete listing of workshops for 2016. 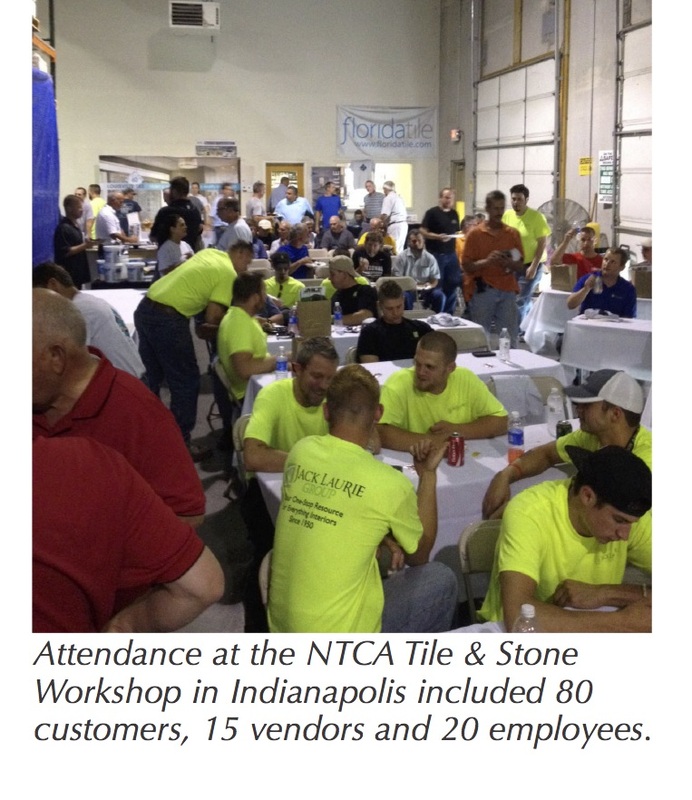 Almost 30 Daltile customers enjoyed lunch and a presentation by new NTCA trainer Mark Heinlein on jobsite failures. 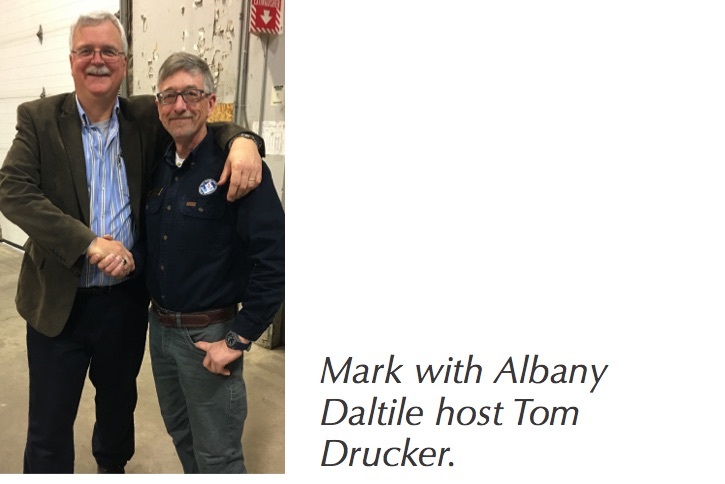 (l. to r.) Mark Heinlein with Daltile staff in Jackson, Miss. 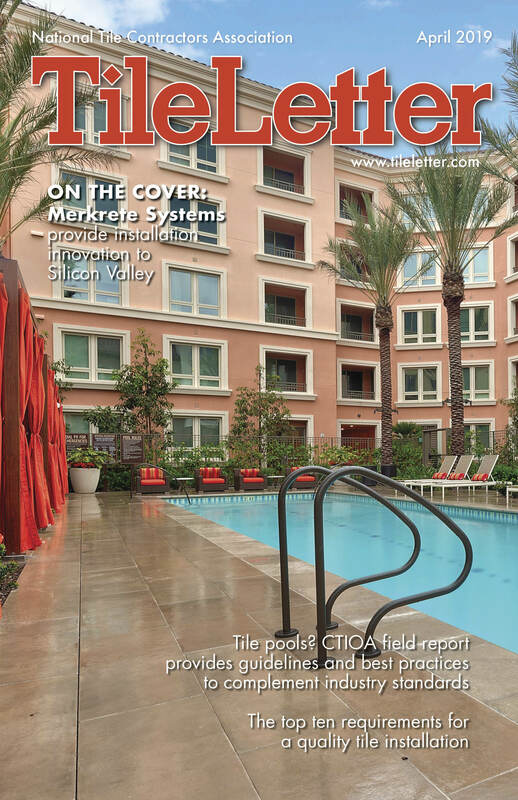 : Chuck Mertz; Waymon Thornton; Maceo Simmons and Heather Smith. 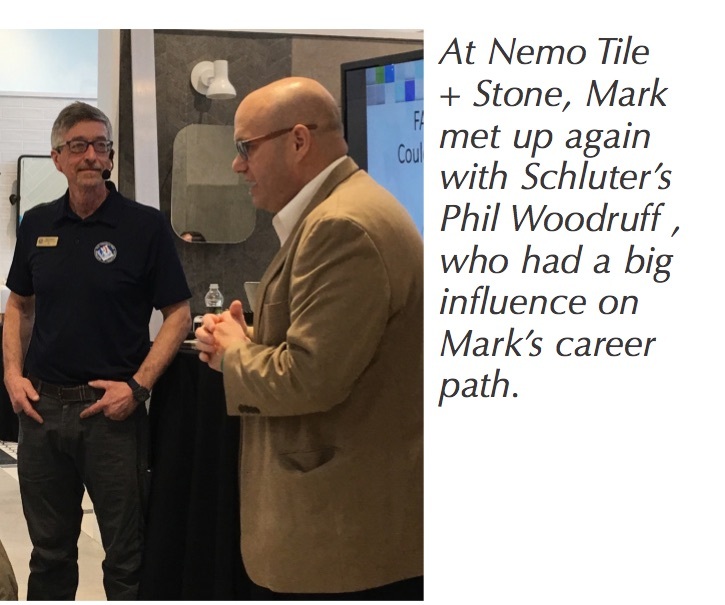 Two new members joined at the Baton Rouge workshop at Daltile, with vendors that included Protecto-Wrap, LATICRETE, MAPEI, Custom, and Pliteq, along with NTCA Louisiana State Director Todd Duhe and Regional Director Tave Baker. Duhe and Baker spoke about the benefits of the NTCA and Qualified Labor and CTI. Shown at Emser New Orleans are: (front row, kneeling l. to r.): Tave Baker; Todd Duhe; Mark Heinlein. (back row, standing l. to r.): Julie Morals; Ashley Salvant; Amy Simmons; Patrick Levy; Simone Giroin; Fenner Sedgebee. Not pictured is Christina Chisolum. 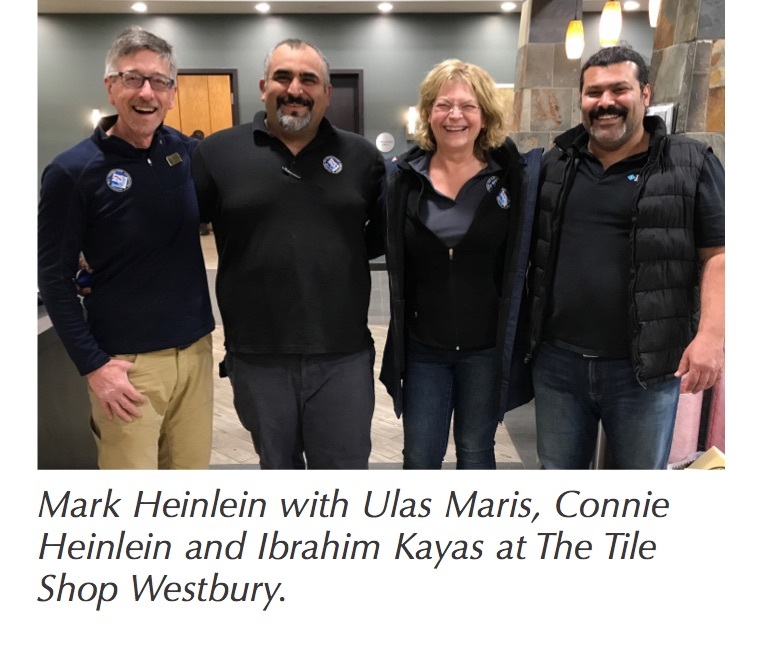 Over the summer months, NTCA presenters Gerald Sloan and Michael Whistler continue road-tripping across the country, bringing the NTCA Tile & Stone Workshops to host sites for an evening of education, camaraderie, raffle prizes, networking and of course, delicious food. 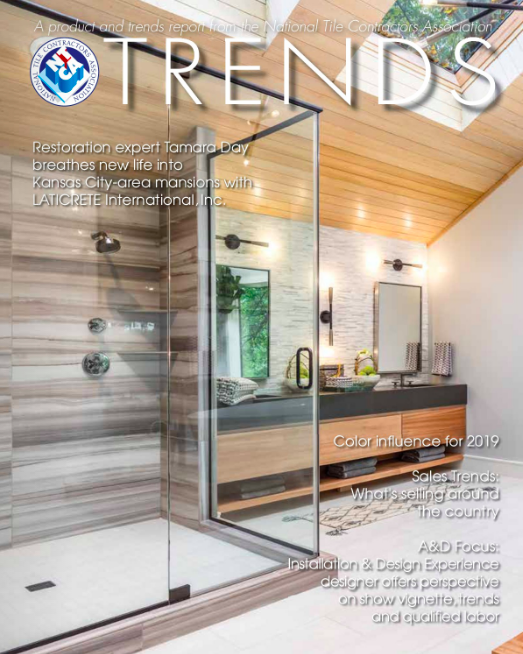 We reported on Sloan’s swing through several Louisville Tile Distributors (LTD) sites in our July issue. 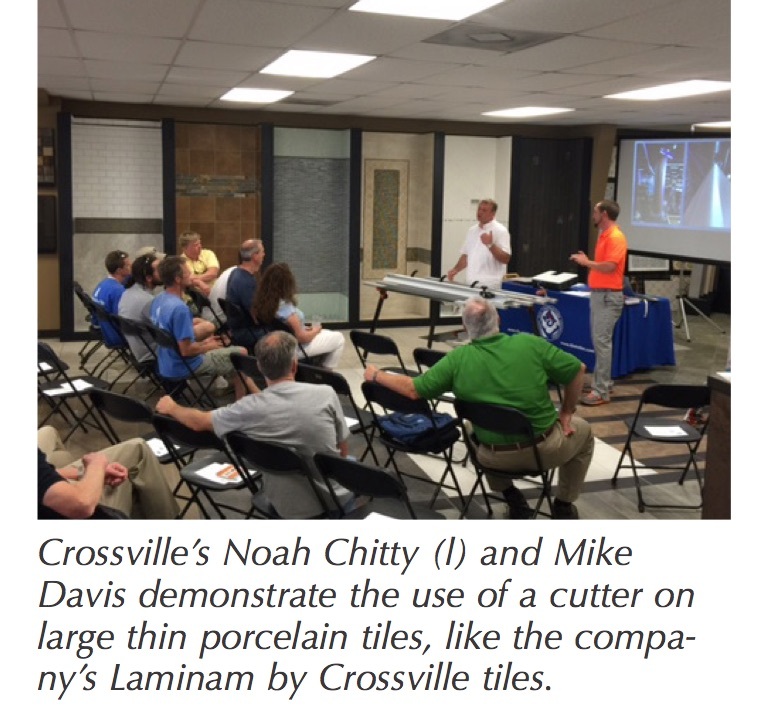 This month, we wrap up with the Knoxville installments of the Tile& Stone Workshop at LTD. 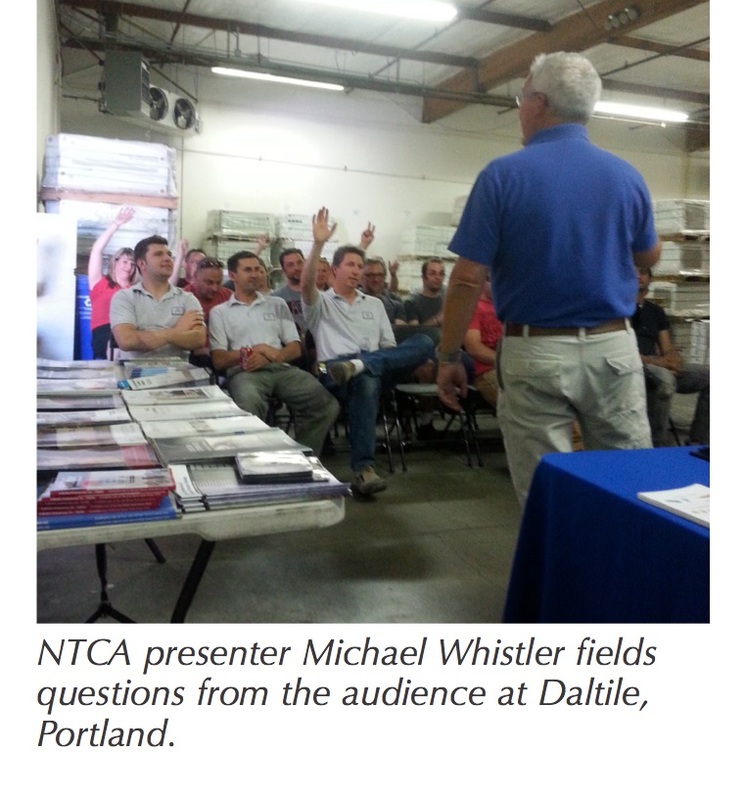 In June, NTCA presenter Michael Whistler toured the Pacific Northwest, bringing the NTCA Tile & Stone Workshop to Daltile locations in Bend and Salem, Ore. Whistler focused on bringing information on mosaic installation, glass tile and pre-manufactured shower systems to the attendees at these events. 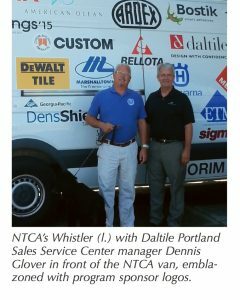 Whistler also rolled out the NTCA Tile & Stone Workshop program at the Portland home of American Olean and Marazzi, two Daltile brands. 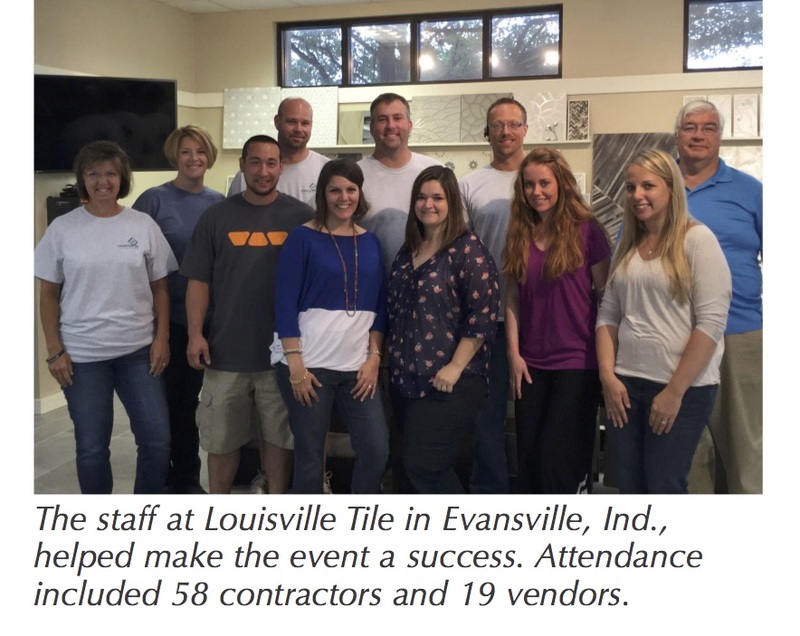 Louisville Tile Distributors (LTD) is deeply invested in education for staff and customers – so much so that the company schedules NTCA Tile & Stone Workshops every other year at several of its locations. At this writing, six workshops have been completed with 248 attendees – and two more are scheduled. 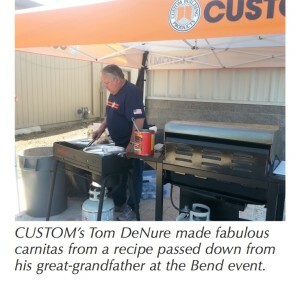 “We anticipate well over 300 attendees,” Kincaid said. 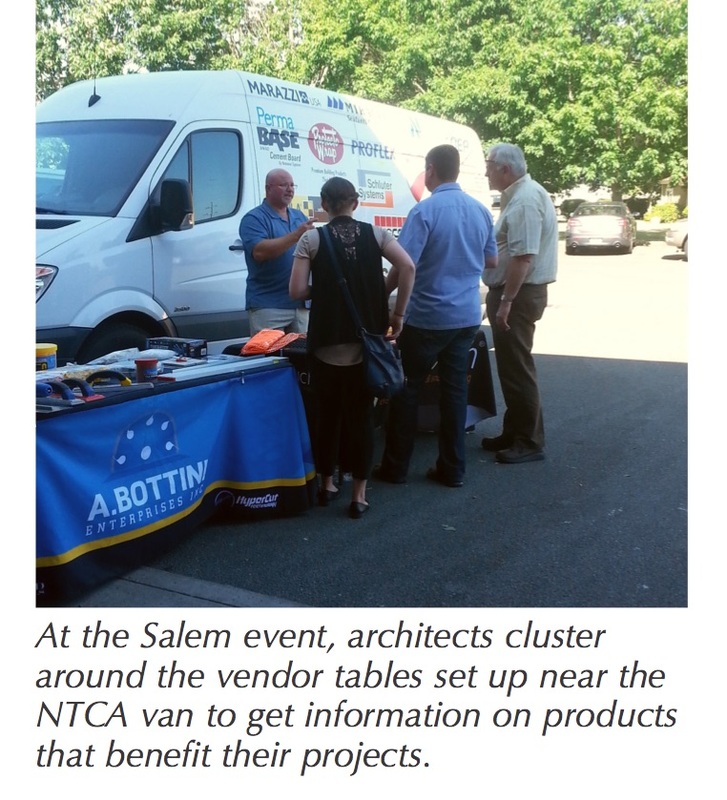 Kincaid added, “Vendor table tops prior to event and the pertinent subject matter during the workshops allow tile mechanics, architects, estimators and all industry attendees a chance to learn together. 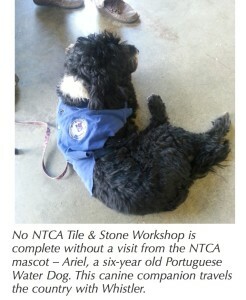 In many cases, full-time mechanics who set tile every day never get the opportunity to see the industry. 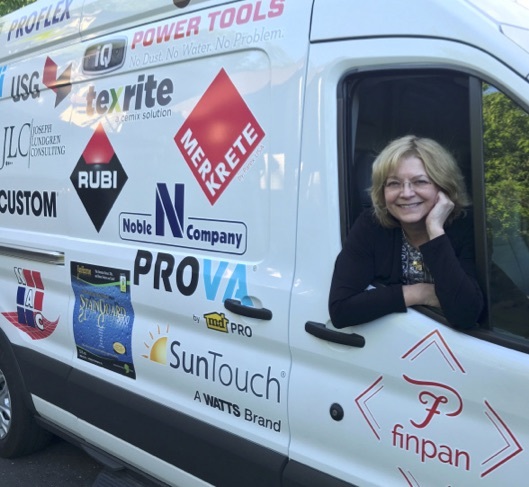 The workshops provide a forum for everyone in the industry to interact with our staff, suppliers and other channel members. The exchange and feedback is invaluable for all attendees. 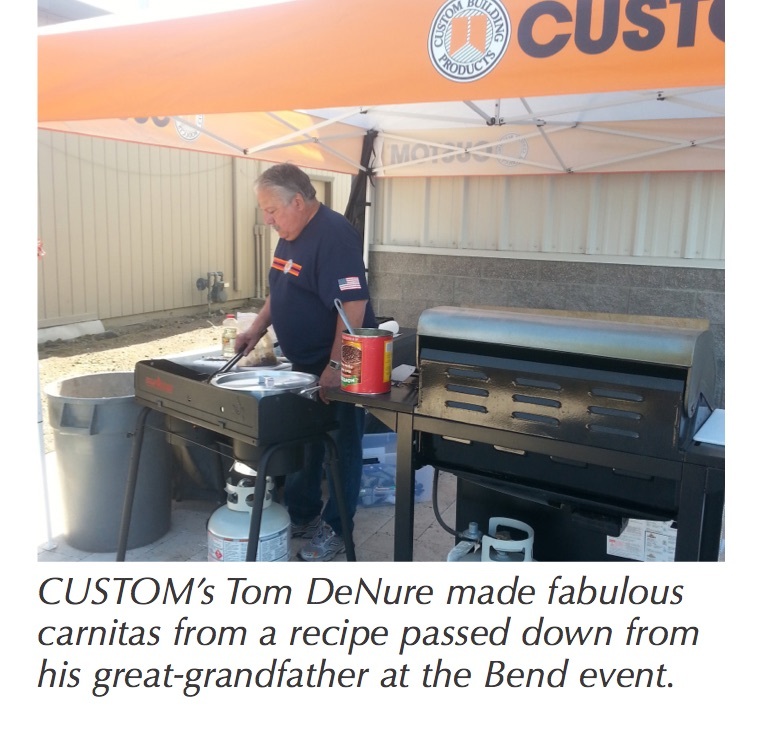 This year was even more special, since the company, which has grown to eight locations, is celebrating its 60th year in business. 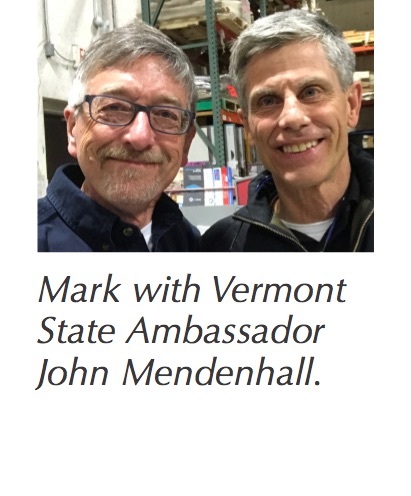 Kincaid said the company is adding its 60th anniversary logo to business cards, stationery, banners and all communication tools this year.